appreciating the significant leaders around me. 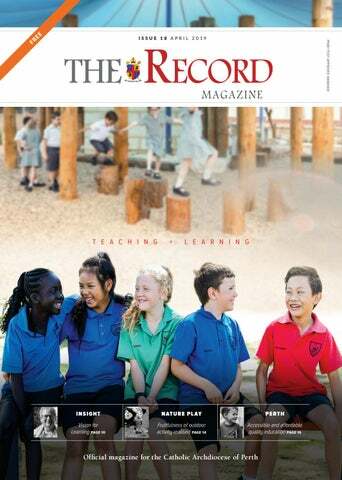 In this issue of The Record Magazine, we take a look at the issue of Teaching and Learning, and what it means for the many teachers, students and their families across the Western Australian Catholic community. of what it means to run around, explore trees, build cubby houses, thus further developing a young person’s physical, social, cognitive and emotional wellbeing. The Record Magazine is a magazine for the people and I hope you will enjoy taking the time to engage with us. Please feel free to share your thoughts via editor@therecord.com.au, 08 9220 5900.
rising of Jesus from the dead. of the real world, not just part of an imaginary world. better than they are, never seems to die. than they are at the moment. For Christians especially this is not an “impossible dream”. us. It is the gift we celebrate at Easter. this special gift of hope during these Easter days. the comment of Mark Twain when discussing lifelong learning. He said that, as an 18-year-old, he was amazed at how very little his father knew, but by the time he was 23 he was amazed to discover how much his father had learned! Twain came to appreciate the lifetime of learning and wisdom his father attained, even though Twain had failed to recognise it as an 18 year old. We begin to learn from birth and never stop. It is wonderful to observe the way a newborn baby is learning virtually from their first moments. The baby already knows the motherâ&#x20AC;&#x2122;s voice and many other sounds that could be heard from within the womb. In the first weeks and months following the birth, the baby learns how to recognise and read facial expressions, along with learning from experiences of warmth and security, nourishment and loving care. We never stop learning. We learn firstly from our families, later at our schools and within our communities. As adults, our learning continues through the interactions we have with others and the broad range of experiences that life throws up for us. Parents are our first teachers. They are assisted by the professional educators in our schools, along with the many people we encounter as we grow to adulthood. The teachers in our schools occupy a special place in our lives and have a profound impact on us. As I was thinking about the theme of Teaching and Learning, I naturally thought of the teachers that I had at school. Each one has left me with something that has carried me through my life so far. land, next to a dairy farm. taught me. It is true. for each one of us, as testified in the gospels. for schools entitled, Making Jesus Real (MJR). attitudes and values in all of our relationships. We often hear parents telling their children to study hard at school, do well, get a good job and work hard. These are certainly noble principles but how often do we hear parents telling their children to, above all else, look for God? Is that not the most important thing? pressure, it’s not even an easy task in a religious school. It also may not come with the instantaneous gratification that apparently comes from watching YouTube videos or playing the Xbox. requires failing in order to learn. of all learning experiences; but God, you do learn”. people regularly make unwise choices. ... a willingness to learn comes from a spirit of humility that accepts someone knows more than they do, and this is not always easy to concede. normally be considered human intelligence or reason. Thomas More (who does tend to swear a little). in the light of the love of God. bestowed on any person in the Church. prayer, meditation and devotion to God. transformational journey of young people. and numeracy,” Mrs Climo explained. “ The first area of Catholic Identity... is about building Christ-centred leaders. Residential colleges and board programs at Catholic schools and colleges is one of the ways Catholic Education Western Australia (CEWA) is working to improve educational outcomes for Aboriginal students. for their needs,” she said. colleges for young Aboriginal students from remote areas. closely with our Aboriginal boarding students,” he said. margins. Through providing equitable access and participation in Catholic education, CEWA schools and colleges improve educational outcomes for Aboriginal students, while acknowledging, respecting and reflecting Aboriginal peoples’ histories and cultures, for the benefit of all. playgrounds popping in Catholic primary schools over the past few years. exemplary young men and women. of ways, according to Assistant Principal Veronica Parker. for their children,” she explained. is not just ‘good’ for a child, but necessary. environment can support the learning program. schools to in its Outdoor Classroom Day. playing video games or browsing through social media. grows and friendships take root,” he concluded. financial needs. “This initiative builds on the imperative laid down in the Bishops’ Mandate to make Catholic Education accessible to all families seeking a Catholic education for their children,” says CEWA Executive Director Dr Debra Sayce. BACKGROUNDS AND FINANCIAL NEEDS, ARE KEY COMMITMENTS OF CATHOLIC EDUCATION WESTERN AUSTRALIA (CEWA). and Our Lady of Mercy Primary School in Girrawheen. Northampton, St Joseph’s Catholic Primary School in Pinjarra and St Joseph’s School in Waroona. St Mary’s School Principal, Melissa Marquis expressed how proud and grateful she felt to be one of the schools selected for the launch of this initiative. St Mary’s School,” Mrs Marquis cited. be able to access it for financial reasons. “This initiative sends a very clear message to the community that St Mary’s School is centred on the needs of the community we serve.” the Principal added. Mrs Marquis expressed that the staff at St Mary’s had always worked hard to build positive relationships with their students, by applying the Early Years Learning Framework principles to ensure the children have a sense of Being, Belonging and Becoming. “The staff also work hard to provide a high level of pastoral care for all students because in a small town, community is everything and as a school in a small community we play such a large role in the triangular relationship of familyschool-parish,” she stated. discussion. “I feel it has had a tremendous and positive effect on our schooling community - from a parent’s perspective, we now feel confident our children can continue their education at St Mary’s without any financial burdens,” she said. learning experiences that we offer,” she said. are so blessed,” Mrs Marquis concluded. esus’ mission that all should have life to the full is at the centre of the mission of Catholic schools across Western Australia. Lathlain and St Francis’ School in Maddington. learning and create positive pathways for their futures. trauma and other significant barriers. uniquely suited to the CARE school approach. ... explore various avenues in education that will be engaging for the youth, while having a strong focus on wellbeing and independent living. get help, even if they don’t believe it. encourage them to commit to finish school. her role as the VET Coordinator for the school. Back row, left to right: Sue Williams, Diane Kounis, and Paula Duggan. Front row, left to right: Trish Jackson, Carolyn Italiano, Chrisine Williams, and Alana Williams with Kyzer the dog. Catholic Education Western Australia (CEWA) has recently launched a resource to develop stronger pathways for students who are preparing to leave school. Year 12 students in 2017 and 2018.
the students work on their TAL,” Mr Hagen told The Record. which at present is 2467 students across its 162 schools. individual instruction and teacher assistant support. Youth Worker Courtney Gratteri with students of St Francis School, Maddington. that process and tell them that they’re not alone. continue on that strong path,” Mrs Gratteri said. St Francis as functioning members of society. experiences throughout their lives,” he added. vital to influence the success of TAL. residential and foster care, since the age of three. world because I know I can do something in this world. “I think because we believe, our young people start to believe. account, or accessing Centrelink support. resource, so that catechists can teach religious education to children who do not attend Catholic Schools. Catechist Service Team Leader, Dr Pina Ford and Consultant, Stephen Harris, who have been developed contributing to the ongoing development of the program since its proposal, spoke to The Record about the key project of the Catechist Service team. “It’s been a journey of about seven years,” Mr Harris explained. “By the end of March, we will have released 55 books of the 70 books making up the total program and we’ve got another 14 that are due to be completed by the end of 2019.” The first release of the program began in 2017, replacing the previous program The Truth Will Set You Free and has since then, been gradually released throughout different year levels to assist catechists in pedagogical practices within parishes. Mr Harris, one of the main writers of the program, together with Dr Carmel Suart, explained that extensive effort went into the collaboration and planning processes before writing. Since publication, the team has been focusing on inservicing. Sometimes this has required travelling to other Dioceses like Bunbury and Geraldton and to parishes like Mandurah and Esperance. By the end of the year, the 70 books of the program will have been released and published, with a broad range of units for students to engage with, such as Jesus, Word, Church, Prayer, Baptism, Confirmation, Eucharist, Penance and Mary, which are repeated across all year levels, as well as social justice, Christian service, Aboriginal spirituality and creation spirituality, which are for example, taught in the post confirmation supplement. Dr Ford explained that children who attend government schools wouldn’t have an opportunity to learn about their faith if not for parish based programs. “Parents send their children to government schools for a number of reasons,” she said. “This program gives those parents who don’t send their kids to a Catholic school an opportunity to help them learn about the Catholic faith.” Both Dr Ford and Mr Harris agree that Gathered in My Name, is an inclusive program that also gives parishioners an opportunity to volunteer within their parish. There is a strong emphasis on Scripture and prayer and on offer is a variety of activities and suggested songs for all age groups. This program gives those parents who don’t send their kids to a Catholic school an opportunity to help them learn about the Catholic faith. “Behind the program is the understanding that catechists are not trained teachers so they need all the help they can get,” Mr Harris said. “It is necessary to provide a comprehensive program that’s age appropriate and interesting for children but can also be used with ease by a Catechist,” Dr Ford said. “But it can also be used with ease by a catechist who’s not a trained teacher.” The program aims to teach the core aspects of the Christian story, focusing on the scriptures while preparing primary aged children to receive sacraments. Through this program, children can familiarise themselves with scripture and have a comprehensive understanding of the Catholic Faith tradition. Dr Ford said that she and her team are passionate about their work. “My team and I are involved in this work because we value it. We value our own faith and we consider it a privilege to provide training and formation for Catechists, and to produce valuable resources such as Gathered in My Name so Catechists are able to share their faith with children.” Dr Ford concluded. at Catholic schools in WA by 2026, this looks set to continue. contribution to the provision of education across the State. the expansion of the system. education for Western Australian communities. well as 60 schools offering outside school hours care. access to Catholic learning environments,” she said. funding provided can actually be used. many schools and colleges across Western Australia. $12,000 - $15,000 per student per year regardless of sector. increase their fees to meet operational costs. on Health Care cards,” she said. diverse population now and in the future. In just a few weeks’ time, the people of Victoria will wake up in a brave new world in which state subsidised suicide and doctor-effected dying are lawfully practiced, despite every other statute in the law book upholding a completely different rule: ‘thou shalt not kill’. prepared to accept this risk itself. injury as we go about our daily work. and do not attract a Medicare rebate. day die by their own hand. or process leads to the death of an innocent person. who want it on medical grounds. Western Australia could be the next State to follow suit. take their own lives, or to have a doctor administer a lethal treatment, on the grounds that it is ‘my life, my choice’. the most restrictive and unworkable in the world. reintroduce the risk of wrongful death once again. need to be amended and expanded very soon. that have legalised assisted suicide. effected death laws in Western Australia? No, we don’t. Can these laws be made safely? No, they can’t. speak up against them, then yes, we probably will. 35	Catechism question: ___ made me? 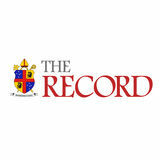 The Record Magazine seeks to promote awareness and understanding of vocation – God’s particular call to each of us to live and become what we were created to be. There are many such vocations – marriage and family life, priesthood, religious life or being single – with the first and universal vocation being to holiness, as described by the Fathers of the Church in Lumen Gentium. The Record Magazine is published bi-monthly. Views expressed in published articles are not necessarily those of the publisher or Editor. The Editor may refuse copy or material, including advertisements, for publication. Inclusion of an advertisement in The Record Magazine does not reflect endorsement or responsibility from the publisher or Editor. The Record Magazine is a member of the Australasian Catholic Press Association and Australasian Religious Press Association. NOTICE The issue may contain images of deceased members of the Aboriginal and Torres Strait Islander community. Images are used with respect and appreciation. Copyright 2019. No part of The Record Magazine may be reproduced in any form without prior written consent from the publisher. The Record Magazine liability in the event of an error is limited to a printed correction. Proudly printed in Australia by Scott Print. This publication is printed using vegetable inks, is ECF (Elemental Chlorine Free) and has ISO approval for international environmental certification.